Oral care is essential for children’s daily lives. However, between the ages of 9 and 12, children become bored with brushing their teeth. The most common reason for toddlers and preschool-age children to resist tooth-brushing is that it is boring. Children may not listen to what their parents say, but they closely watch what we do. In the current market, many toothpaste products are flavored and designed with colorful images. But the brushing experience is still not engaging. 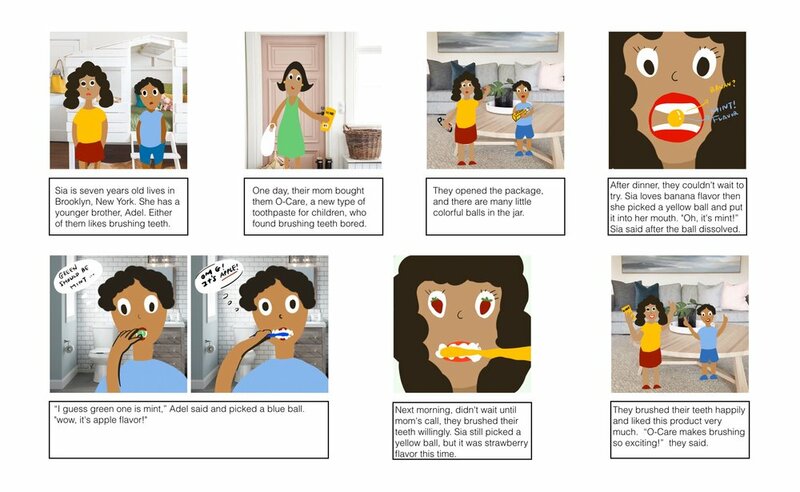 How do we create the brushing experience more exciting for children so that they are more willing to brush their teeth? 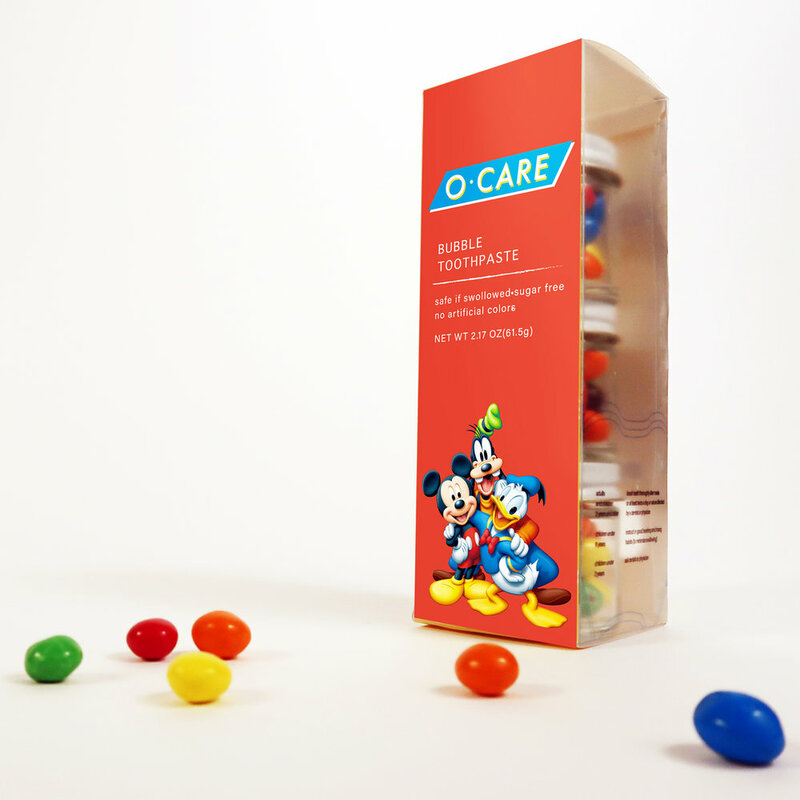 O-Care is a new type of toothpaste in candy shape for children who are bored with brushing their teeth. Children can pick a quick to dissolve chew from the box, but each chew’s color does not indicate its flavor, keeping children engaged. How might we make cleaning your teeth exciting? Children love colorful objects and sweet flavors. 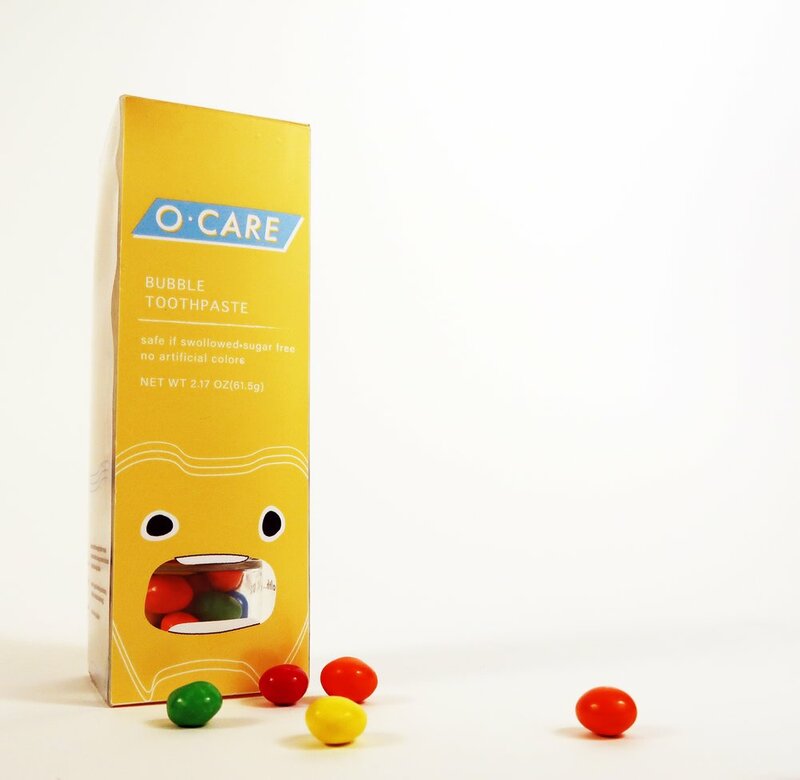 O-Care creates a daily excitement by a random flavor of toothpaste bubble that children can’t guess. For example, by children might guess red color indicates apple/strawberry flavor, however, it could be mint, banana, grape, any random flavor. Start brushing child’s teeth as soon as the first tooth comes through, usually at around six months of age. Baby teeth help children to eat and speak, and guide the permanent adult teeth into position, so it is important to take care of them right from the start. Nearly half of parents (45 percent) say getting kids to brush their teeth is one of the most challenging things to get their kids to do. That’s slightly higher than getting children to eat vegetables regularly (42 percent) or getting their help with household chores (41 percent). Forty-one percent of parents also said it was a challenge to get their kids to floss their teeth regularly. 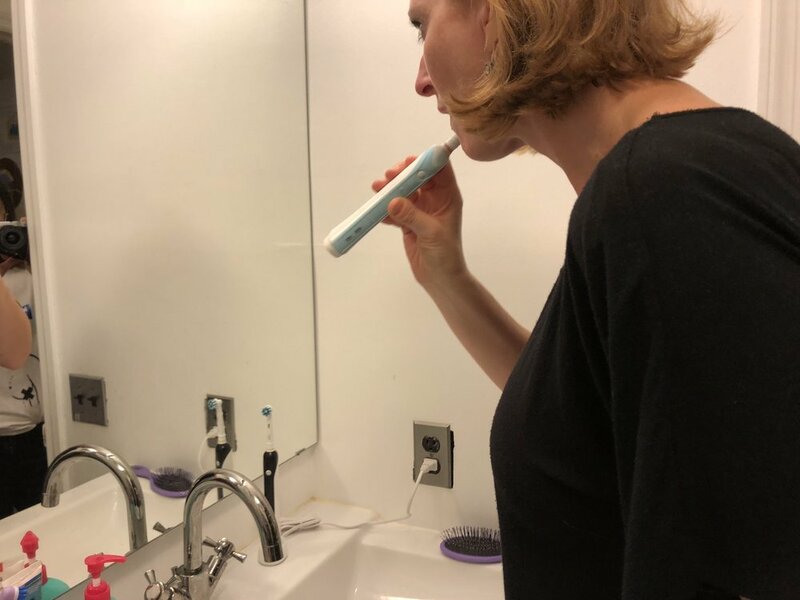 — Sandi Ernst Perez, Ph.D.
We conducted interviews two families with kids aged under 12 years old and observed five kids, four boys and one girl, how they taking care of their oral health including their interaction with oral care product and brushing their teeth. We also observed how their parents brushing teeth and asked parents about eating habits of their family and how they taught their children about oral care. Kids love surprises. Mismatch colors and flavors. Use Xylitol, which doesn't promote cavities, as a natural sweetener. 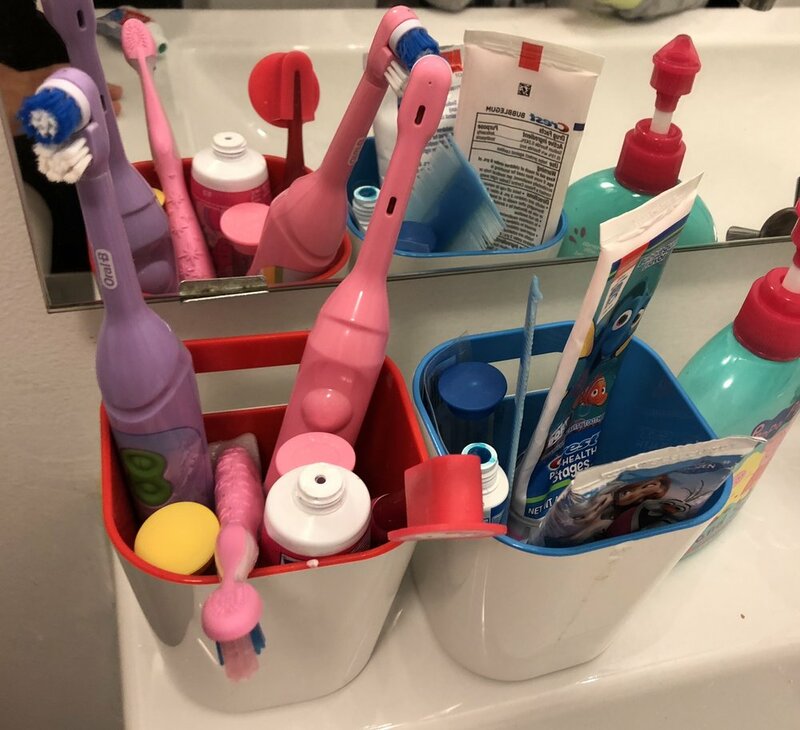 "Boutique products are winning the day"
Mara from family 2 wants to get the right oral care products for her family without spending too much time in the oral care aisle. The dental office educates the parents, but often other people are involved in raising child. These people are often the most likely to break the child’s diet. What we eat influences our mouth ecology—children with no tooth decay go to college and experience tooth decay because of a change in diet. The diabetic exchange diet for diabetics who rely on insulin is almost the ideal diet to prevent tooth decay. What matters isn’t the amount of sugar we consume; what matters is how we consume it. We conducted user research at several points in our design journey. We also found out several pain points according to the user journey, such as 'bored' and 'confusion' etc. and to gain insights from their oral care system. Then drew insights from processes and created several “How might we...” statements to try to intervene in the insight areas. By asking three "How might we..." questions we did brainstorming. After building user journeys and brainstorming, we narrowed our scope of ideas to three. 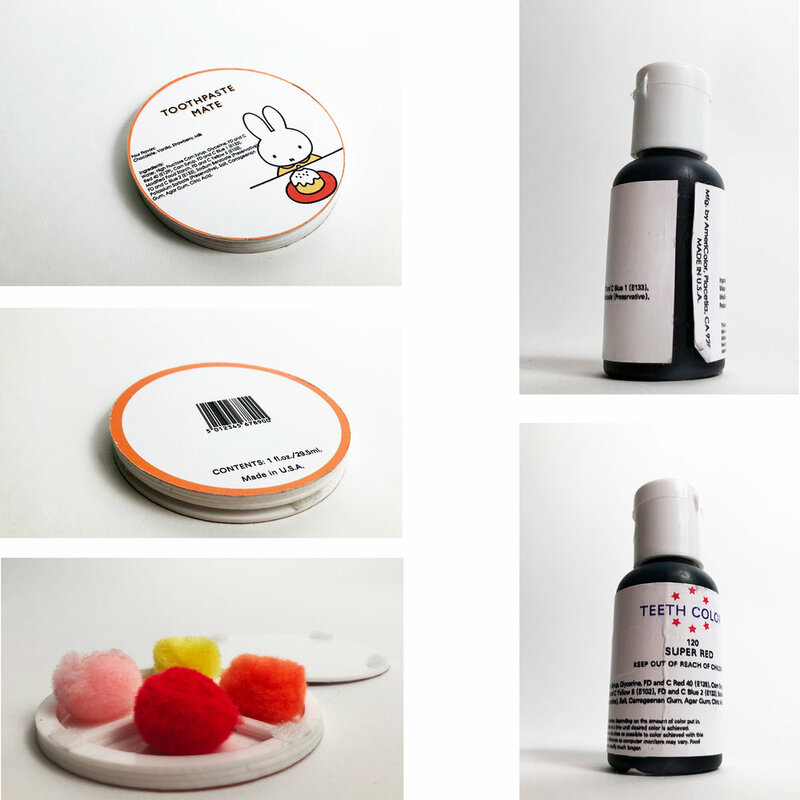 Here are two selected prototypes: 'toothpaste mate' which is flavored powder partner with toothpaste, and 'teeth color' that people could dye their teeth as a fashion way. We took prototypes into the field as sacrificial concepts to get user feedback and see how our target audience interacted with them. We combined two of our ideas into one, and prototyped it. 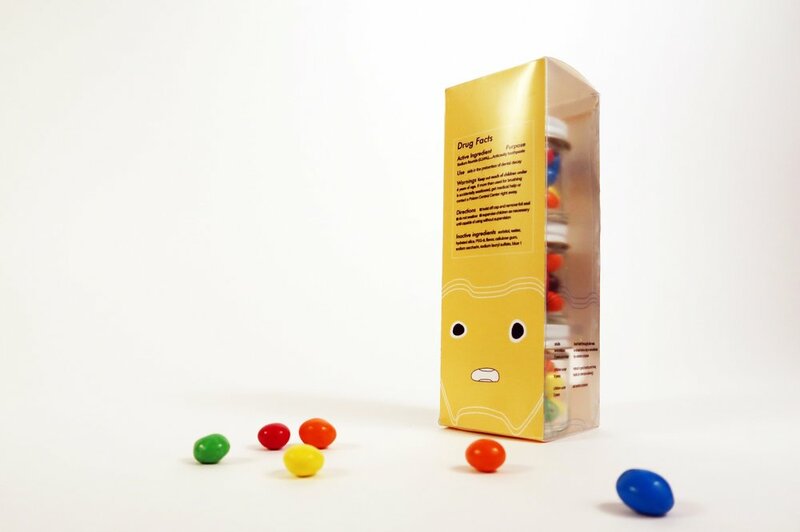 The container is designed like a candy bottle, the small ball resembles the shape of the toothpaste. Cartoon image attracts our target audience. 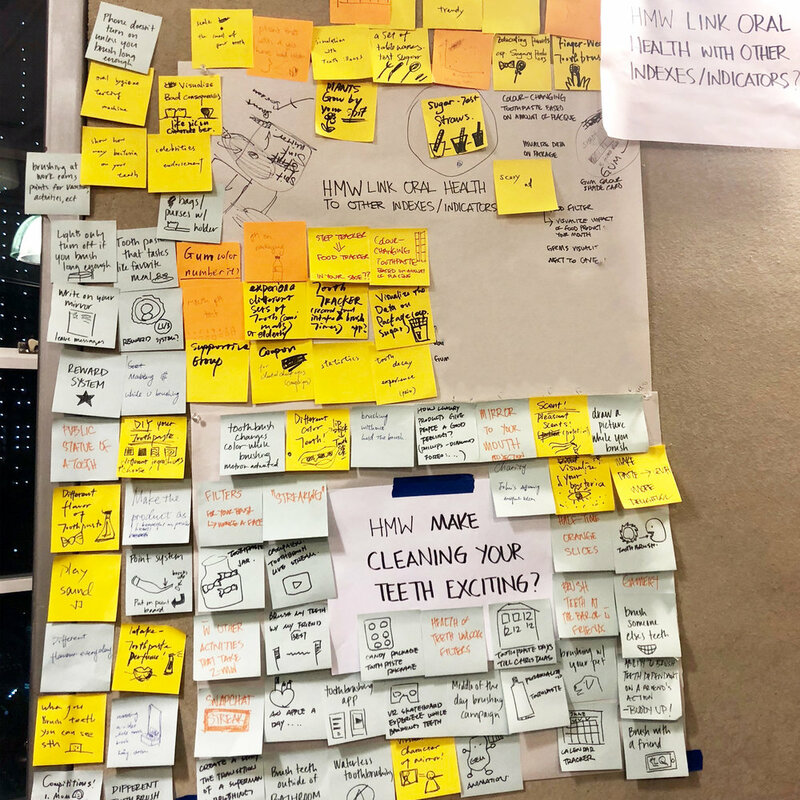 From there, having learned about what characteristics of each of the two ideas resonated with our audience, we developed a final model, which hit on our key insights and user testing feedback. Our example of this collaboration is with Disney that we could reach our target audience easily. We would collaborate with a company with access and a loyal consumer base that overlaps our target audience.